Featuring sound-reduction properties, BAL Single Part Fastflex is highly flexible and can also be utilised as isolating, anti-fracture underlay for ceramic tiles. Recommended for areas subject to limited movement and vibration, BAL Single Part Fastflex is water/frost resistant and is suitable for fixing ceramics, porcelain and vitrified tiles, mosaics, slate and certain natural stones including marble, terrazzo in dry or wet interior and exterior environments. If you’re looking for an highly flexible, sound-deadening floor tile adhesive then this is the product for you. Available in 12.5kg packs, BAL Single Part Fastflex can be grouted after five hours. Please note this product is not suitable with BAL Rapid Mat, and when used on walls, battons will be required. Contact TAS when recommending approved sound-reduction systems. BAL New Floor is a standard-setting, flexible tile adhesive for new cement and concrete floors. Allowing fast-track installations on new concrete after seven days, and new cement:sand screeds after 24 hours, BAL New Floor is suitable for fixing ceramics, porcelain and vitrified tiles in dry or wet interior and exterior environments. Water and frost resistant it can be grouted after 24 hours. A deformable tile adhesive for floors, BAL New Floor is flexible and water/frost resistant with an open time of 20 mins, with pot life of 5 hours allowing for larger installations. BAL New Floor is particularly recommended for swimming pools and showers, areas of limited movement/vibration and low porosity substrates. BAL New Floor is suitable for bed thickness 3-6mm (up to 12mm in localised areas) and typical coverage is approximately 3m2 per 15kg bag . Only available at Topps Tiles. Looking for sound-reduced floors? Then ask your tiler for BAL Single Part Fastflex, which has been independently tested for its sound-reduction properties. Suitable for use with most types of tiles and certain natural stone, it helps meet Building Regulations for sound resistance. Please note this product is not suitable with BAL Rapid Mat, and when used on walls, battens will be required. Contact TAS for more information. Featuring sound-reduction properties, Single Part Fastflex is highly flexible and can also be utilised as isolating, anti-fracture underlay for ceramic tiles. Recommended for areas subject to limited movement and vibration, Single Part Fastflex is water/frost resistant and is suitable for fixing ceramics, porcelain and vitrified tiles, mosaics, slate and certain natural stones including marble, terrazzo in dry or wet interior and exterior environments. This adhesive should be specified to help improve sound-reduction properties of floors and help achieve the requirements of Building Regulations Part E (Resistance to sound). Single Part Fastflex has been independently tested for its acoustic properties. When specifiying sound-reduction systems, please contact BAL Technical Advisory Service for support. BAL Single Part Fastflex offers outstanding sound-reduction properties and will help you achieve the requirements of Building Regulations Part E (Resistance to sound). Suitable on most backgrounds, BAL Single Part Fastflex offers open time of 20 minutes and pot life of 45 minutes. Please note this product is not suitable with BAL Rapid Mat, and when used on walls, battens will be required. Contact TAS when recommending approved sound-reduction systems. BAL New Floor is a standard-setting, flexible tile adhesive for new cement and concrete floors. Allowing fast-track installations on new concrete after seven days, and new cement:sand screeds after 24 hours, BAL New Floor is suitable for fixing ceramics, porcelain and vitrified tiles, mosaics, certain natural stones and terrazzo, rigid form insulating materials and brick slips in dry or wet interior and exterior environments. Water and front resistant it can be grouted after 24 hours. Specify BAL New Floor on your M40 or M20 specification for large-scale commercial floor tiling projects on new cement and concrete screeds. Modified with polymer, BAL New Floor is flexible meaning it is suitable for swimming pools and showers, and areas subject to limited movement and vibrations such as heavy-use commercial projects. Please note that BAL New Floor is not suitable for certain types of natural stone that may be susceptible to water staining. In this case specify a BAL rapid-setting white adhesive such as BAL Pourable One. 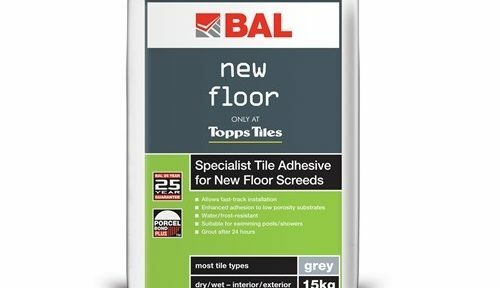 Contractors should consider using BAL New Floor for tiling projects on new cement and concrete screeds. With an open time of 20 mins, and a pot life of 5 hours, BAL New Floor allows for tiling floors in large installations. Modified with polymer, BAL New Floor is flexible, meaning it is recommended for swimming pools and showers, and areas of limited movement and vibration such as heavy-use commercial projects. BAL New Floor is suitable for bed thickness 3-6mm (up to 12mm in localised areas) and typical coverage is approximately 3m2 per 15kg bag.